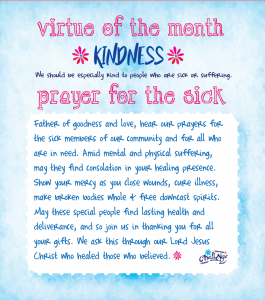 The virtue of the month for Challenge and Conquest in July is kindness. Kindness fascinates people and warms hearts. It is a game changer in a person or a friend. Kindness is being gentle, thoughtful, helpful, and forgiving at times when it would be so easy to be angry. A kind word can conquer anger, calm the spirit, and even start a friendship. Small acts of kindness can go a long way. The kind look, gesture, or word can be as beneficial as the kind deed. Christians should be ambassadors of kindness. The first Christians were known for the love and kindness they had for one another. This converted soldiers and rulers to follow the faith. There is a pretty well known saying that kindness is just a little love with work boots on. Kindness is a result of a heart full of love. It is what happens when love is put into action. In our Catholic faith, we have the 7 gifts of the Holy Spirit and the fruits of being close to the Holy Spirit. One of those fruits is kindness. The Youcat number of the month is all about love and kindness. # 524 What does it mean to say Father Forgive us our trespasses as we forgive those who trespass against us? Merciful forgiveness – the mercy we show to others and the mercy we ourselves seek- is indivisible. Because we have a kind Father, forgiveness and reconciliation in life are possible. Many people have a lifelong struggle with their inability to forgive. The deep blockade of being unreconciled is resolved only by looking to God, who adopted “while we were yet sinners” (Rom 5:8). Because we have a kind Father, forgiveness and reconciliation in life are possible.